Since most concepts learnt in this course are new and unfamiliar, students are expected to attend the first day of class to avoid falling behind. Instructor will not accept any student after the first day of class. Apply the principles of contract law that govern the employment relationship from formation to termination. 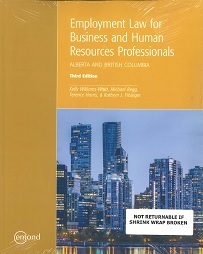 Outline the key steps involved in employment law dispute resolution, including the administrative tribunal process, traditional litigation and alternative dispute mechanisms. Design practices to effectively reduce the risk of wrongful dismissal disputes and other legal causes of action. Interested in being notified about future offerings of BLAW 3905 - Employment Law? If so, fill out the information below and we'll notify you by email when courses for each new term are displayed here.